These cost-effective landscaping ideas will help you create your dream garden. A great garden can raise a home’s value. But, perhaps even more importantly, it can raise your spirit. Once you’ve got a plan, work within your budget by choosing less expensive materials for your design. If, for instance, you’ve got a small budget and want a patio, “use crushed rock or decomposed granite,” St. John suggests. Keep in mind that “the least expensive materials for your garden design will be plants,” St. John says. They’ll bring color, texture and dimension to the space. Whether you hire a professional to help you execute a plan or go it alone, there are a number of elements of good design you’ll want to incorporate into your home garden. How much shade do you want and where you want it? “Keep in mind that the smaller the size of the plant, the faster its rate of growth,” St. John says. Incorporate a small tree this year, and it should catch up quickly. Plus, a smaller tree is “less expensive to purchase and less effort to plant,” she adds. If your garden is already shady, a trellis, which you can buy ready-made if you want, lets in sunshine but offers privacy. “Screening — from other houses or structures — is another key element,” St. John says. Freshen up your garden by pressure washing an existing concrete patio — and it will look like new. Generally speaking, you can use softer or less-treated woods if you live in a mild climate. In harsher climates, you’ll want to use pressure-treated, more durable woods and finishes. Create a sense of mystery and exploration with meandering trails that lead to a table, bench or fountain. Decide whether it should be neatly edged and formal or blend into surrounding spaces. Wood chips are one cost-effective way to mark a path, but you can also use pine needles, gravel or decomposed granite. “Or try using a ground cover like woolly thyme,” St. John suggests. Features like a fire pit, bowl or chiminea (a stove-like outdoor fireplace) are portable and offer a design focal point. You can spend a bit more to have a stationary wood-burning stove or plumb a gas line. As for a water feature, “you can have a totally self-contained one that’s not too expensive,” St. John says. But don’t forget to factor in the costs of running electricity to fuel the pump, which filters and recirculates the water. “The benefit of water is that it adds an amazing dimension to the garden, and if you live on a busy street, the sound of running water in a fountain helps mask noise,” she says. 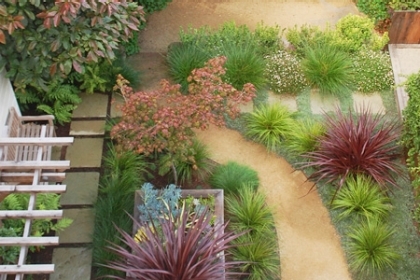 Design garden spaces as if they’re rooms. Carry the continuity of your interior design out to the garden. You can get fairly inexpensive furniture and dress it up with pillows covered in outdoor fabric. Extend your home to the outdoors. If you’re going to stop and smell the roses, remember: You have to plant them first.